Review In A Nutshell: A Touch of Gold puts an adventurous twist on a well-known myth, and overall is an entertaining read. A Touch of Gold follows Kora, the daughter of King Midas, who is still suffering from the side effects of his curse. After her father accidentally turned her into a golden statue, her skin still glimmers gold. When the rest of her father’s cursed gold is stolen, Kora must use one of the unique abilities she has gained from the curse to hunt it down and save his life. While the initial premise of the book is promising, the rest of the plot is neither good nor bad. There are a couple surprising twists, but most of the other twists are predictable. The first half of the book feels a little slow, mostly because if you read the description on the back of the book you pretty much know what will happen, and the “how” aspect of it is fairly straightforward. However, there are plenty of action scenes and interesting plotlines that pull you into the book. This book is based off the Greek myth and uses the names of the Greek god Dionysus, but the rest of the world is fairly murky. While there are some unique aspects to the setting and certain areas are well developed, everything else just falls into the background, making it hard to get a full picture of this world. The cast of characters in this book felt very one dimensional. Kora suffers the most from this- as the protagonist, she can be bland and uninteresting, with her few personality traits sometimes bordering into annoying. Royce and Aris are definitely the two most compelling characters, their stories and personalities both felt well developed and led to some of the most intriguing aspects of the book. Hettie also had an interesting character arc, and I would have loved to see some of this from her perspective. Meanwhile, the others characters just existed. They had a couple of traits each- enough to include some fun banter and serve as cannon fodder. The writing is where this book really shines. Annie Sullivan’s writing style is a great balance between eloquent and straight-forward, giving the prose a fantasy-feel while also being accessible and easy to jump into. I loved her writing style (especially in the prologue!! ), and I feel it is definitely the best aspect of this book. I’m really looking forward to seeing what she might write next! Pros– Beautiful writing, interesting premise, yay greek myths! 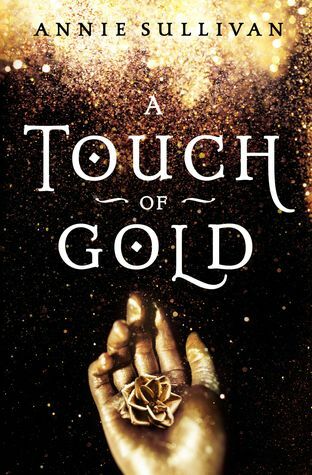 A Touch of Gold is an interesting take on the Midas myth, and while I did enjoy it, it isn’t my favorite fantasy/pirate tale.